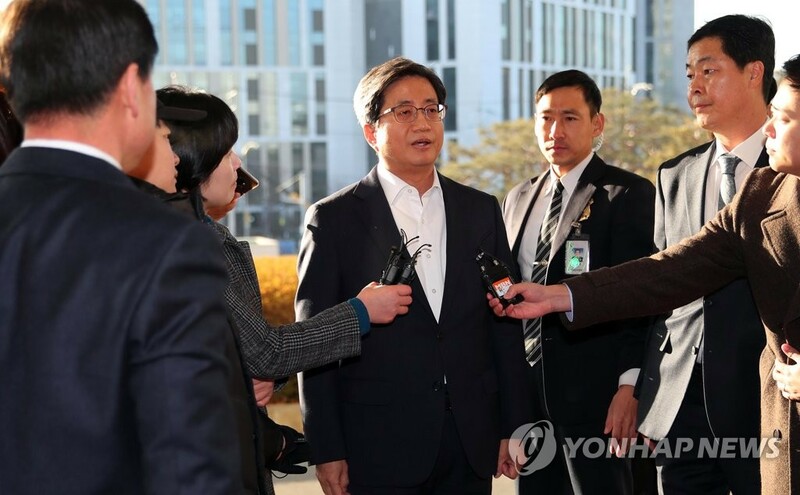 SEOUL, Jan. 24 (Yonhap) -- Incumbent Supreme Court Chief Justice Kim Myeong-su apologized to the public Thursday over the unprecedented arrest of his predecessor in a massive power abuse scandal. Hours earlier, the Seoul district court approved the arrest warrant for former top court chief justice Yang Sung-tae on charges that he abused his authority to use trials as a political tool to lobby the office of the then President Park Geun-hye. "I would, again, like to apologize to the public. I feel wretched and ashamed," he told reporters outside the Supreme Court building. "I don't have the words to describe how I feel or what I could say at this stage so as to at least offer even a tiny bit of comfort to everyone." Yang is the first former South Korea's top court chief to have been questioned by prosecutors and then detained prior to indictment. The disgraced retired justice is facing a trial on more than 40 criminal charges. Yang has denied the charges and told the court on Wednesday that he was being "framed" by other judges. The scandal has placed the country's judiciary under intense scrutiny, drawing a mixed response from court officials. While some say the probe is legitimate, others disapprove of it. Kim, who was appointed to Yang's post in 2017, has been facing the pressure of having to find a balance between the positive and negative views. Speaking to reporters on Thursday, he bowed at the start and end of his statement. "Everyone of us at the judiciary will continue to do our jobs faithfully. That is the only way to overcome the difficulties and the least we could do to measure up to public expectations."